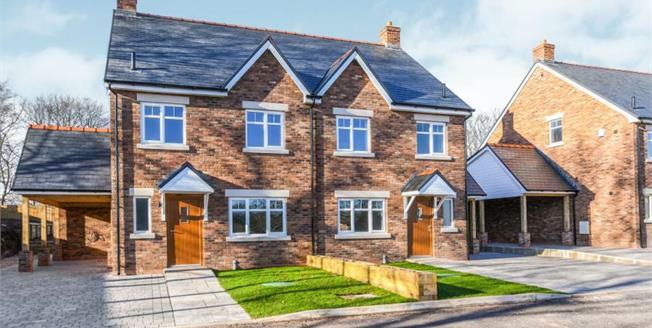 Situated in the idyllic Village setting of Daresbury, the development offers a cosy country setting whilst still being extremely well connected to the surrounding towns and cities. The development comprises four spacious, four bedroom semi-detached family homes and one four bedroom detached home. All of the properties are built to a high standard and specification and come with a full structural warranty provided by Premier Guarantee. The houses are also registered with the Help to Buy scheme. "High quality bathroom fittings & quality tiling. "Large patio areas & tiered gardens. Built from a traditional brick, with a slate tile roof, these properties will be finished to an immaculate standard and feature an impressive open plan kitchen/living area complete with breakfast island with Bi-fold doors onto the spacious garden. The internal accommodation comprises a downstairs WC, entertaining lounge, open plan kitchen and family space. Upstairs there are three spacious bedrooms and a four piece family bathroom, whilst up on the second floor there is the master suite. The entire second floor is dedicated to the master bedroom which includes his-and-hers wardrobes, double height Velux roof windows and a three piece master ensuite bathroom. Hatters Close is within the very heart of the Daresbury Village Conservation Area situated on the original Roman Road to Chester. Daresbury Village sits equidistant from Liverpool and Manchester, making it perfect for the people working in the cities. The Village also has bus links into Warrington and the charming Stockton Heath which has a wealth of restaurants and boutique shops which are only a short drive away. The opening of the Mersey Gateways Bridges has opened up a rapid access to areas on the other side of the Mersey. As such Liverpool Airport is now a mere 20 minutes away with Manchester Airport taking the same time. With the heart of the Cheshire countryside being only a short distance away and the access from the M56 towards North Wales, Daresbury Village is extremely well located. The Village also houses, Daresbury Primary School. It well regarded for its educational excellence. All Saints Church which features an impressive memorial window depicting scenes from Alice In Wonderland. All in all, Hatters Close within the heart of the historic Village provides an excellent family lifestyle in an exclusive setting.